This red velvet milkshake combines moist red velvet cake with decadent cream cheese icing makes such a delicious treat!! Howdy Folks!! How was your Sweetest Day? Have you heard of it? Do you celebrate it? Most say that it’s only celebrated in the Midwest states of Illinois, Indiana, Michigan, Ohio and Wisconsin but I hear that’s it’s spreading throughout the country. 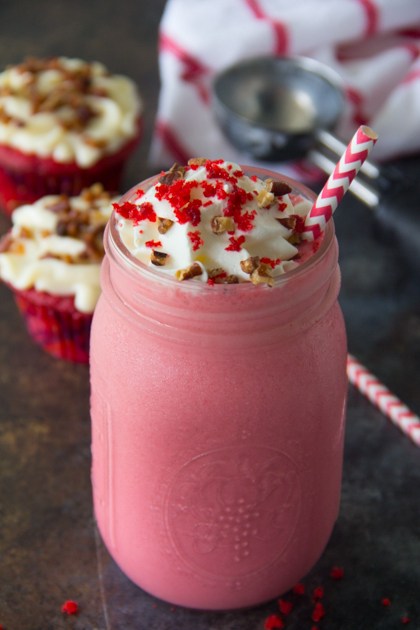 I was enlisted to make my super popular red velvet cupcakes for a going away party and I had a few leftover so I thought to make this Red Velvet Milkshake for hubby and I to share. What a treat?!?! It was tough to share as it was so yummy that I wanted one of my very own. If you’ve tried and love my Red Velvet Cupcakes in a Jar, then you will just go bonkers over this blend of moist red velvet cupcakes, natural vanilla ice cream, homemade cream cheese icing and whole milk. OMG!! I’m salivating just typing about it!!! You just have to make it!!! This delicious Red Velvet Milkshake makes me think about the love of God. It reminds me of the John 3:16 scripture, which states “For God so loved the world, that He gave His only begotten Son that whosoever believeth in Him should not perish, but have everlasting life” (KJV). It’s almost unbelievable when you think about the amount of love that He has for us, yet He wants us to understand its height, depth, width and breadth for HE IS LOVE. He sent His only Son to the cross because He loved us all just that much! Isaiah 1:18 states, Come now, and let us reason together, saith the Lord: though your sins be as scarlet, they shall be as white as snow; though they be red like crimson, they shall be as wool. What an Awesome Wonder He is! Hallelujah!! Yep, this yummy Red Velvet Milkshake totally took me there. I love it how He reminds us in the little things! ? Say Grace and enjoy! This red velvet cake milkshake combines moist red velvet cake with decadent cream cheese icing makes such a delicious treat!! Using a blender, blend ice cream, red velvet cake crumbles, milk, and cream cheese icing until smooth. 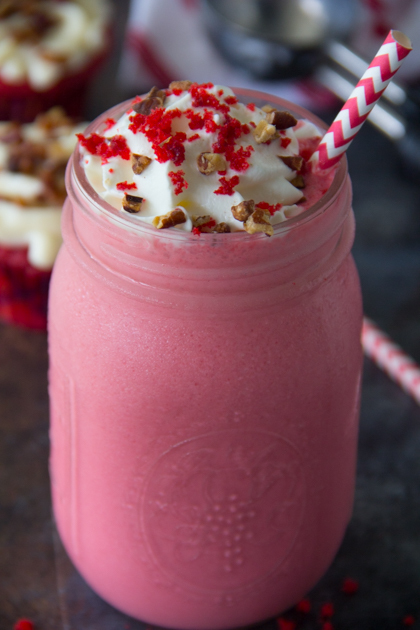 Pour milkshake into glass, top with whipped cream, red velvet crumbles and toasted pecans. Say Grace and enjoy!! Can’t get enough of that Red Velvet flavor?!? Try my Red Velvet Waffles too!!! 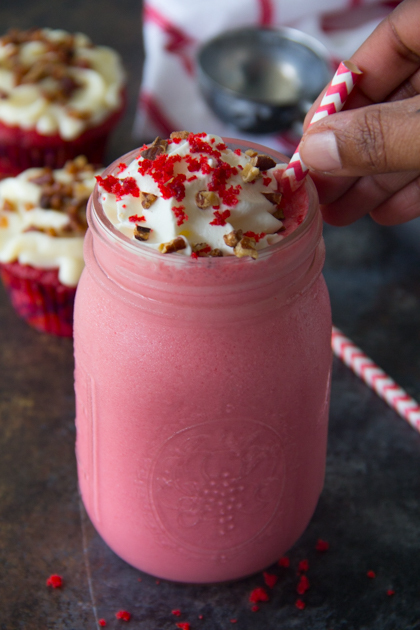 Love the sound of this red velvet milkshake, such a nice treat, I need to try it, that’s if I can stop myself eating all the red velvet cakes! So pretty too!. I’ve never used cake in a shake before. Sounds delicious! Thanks Ginny!! It tastes even better!! What a decadent milkshake! It sounds incredible! Thanks Jessica!!! Such a treat!! Wow! My husband would just die if I made this for him! Red velvet is his favorite 🙂 This seems like a simple after dinner treat and I’m loving it! Never heard of this sweetest day thing but this sure sounds like the best recipe for it! Okay Felisha, you’ve reached a new high with this one! That shake looks, and sounds AWESOME!!! 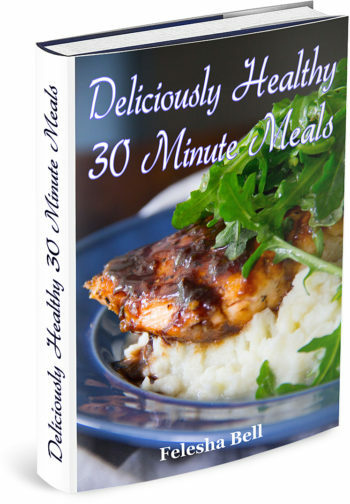 I can only imagine the taste, and look forward to the day that I make this delight that you’ve created. Thanks for having such a creative mind. Thanks Kelly! Wish I could take the credit for this awesome idea!! It is phenomenal! !